Last edited by Chad; 10-15-18 at 06:47 PM. Found the movie quite enjoyable. Really enjoyed the performances of the actors. Wasn't horror enough for me, I enjoy a higher kill count. I was also a little disappointed at how quickly I guessed the film's twist. My biggest nag of the movie was how long the "chase through the museum" scene was. Felt like running time filler to me. It's been a while since I'd seen this one. Nice to revisit it. Kind of forget how creepy Michael Caine can be. He gets so downright respectable in later films. The Hitchcock/Psycho "homages" didn't bother me as much this time. Nancy Allen is the most girl-next-door call girl ever. Everyone has such nice bathrooms. Still think the ending is a bit of a letdown. So I’m pretty sure that was a first time watch just now. 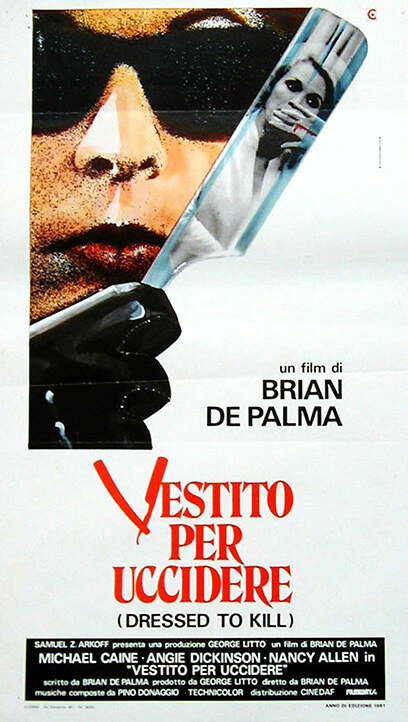 Not my favorite De Palma, but I always enjoy his style. Unexpected bonus for the Criterion BD version at least: it’s the unreleased version originally rated X by the MPAA, so checklist freebie! De Palma is clearly ripping off Hitchcock here. Although transgender people and mental illness were easy punchlines back in the day, nowadays those subjects are much more problematic. You have to admire De Palma's direction; you can see "Bobbi" in the background three different times before she kills Angie Dickinson's character. I really enjoy seeing Nancy Allen in films, it's a shame she gave up show business. I agree about both the bathrooms and Nancy Allen. She's so good in this. I watched RoboCop and was lamenting to a friend that she's not in that film nearly enough. This was my first time seeing this, and I really enjoyed it. Michael Caine is great as the steely psychiatrist who cannot help but surround himself with mirrors that foreshadow the twist. I'm not terribly found of the twist or horror films that lean on the "queer people are CRAZY MURDERERS" trope. Random Thought: Peter looks like Harry Potter, and it distracted me during his scenes - not that's Keith Gordon's bad (I thought he was quite good) but he always made me chuckle. Random Thought 2: The Doctor Explanation that appears here isn't nearly as lively the one from Psycho. I thought I was the only one thinking this. It really pulled me out of the movie at times, which was a shame! I enjoyed Dressed to Kill - it's very stylish that flirts with blunt themes like with the promiscuous but adult initial victim. I feel like the film came close to being more frank about sexuality but then cheaps out with transgender phobia. Maybe this was all the more lurid in 1980s but like others have said Nancy Allen is the sweetest most subdued call girl ever. There were moments of brilliance like the std red herring leading to and including the first murder or the random taxi cab fling. Agree the resolution was predictable, it's not clear to me if this is because some of the film is perhaps intentionally cliche ripping off other movies or itself being mimic-ed in some later installments. Maybe it's the New York setting but I'm reminded of Fulci's New York Ripper, two years after this one. It might have helped for the movie to be a little longer and to introduce some more characters/motives. Gutsy of them to spend the first 10-15 minutes with one character then slash her. The opening scene has one of the most jarring body doubles in recent memory, skin tone doesn't match. The overly word police department explanation of the end is unintentionally funny. Although transgender people and mental illness were easy punchlines back in the day, nowadays those subjects are much more problematic. I'm not terribly found of the twist or horror films that lean on the "queer people are CRAZY MURDERERS" trope. That was my thought also, it's kind of a shame movies that are well done end up resorting to stigmatizing people for their sexuality or mental health. Even 'multiple personalities' is really tired and realistically not very common (granted horror doesn't have the be realistic but when the crux of some many movies is an extreme form or exceedingly rare mental condition it's groan worthy). I wish there was more ambivalence from the villain, he was either a convincingly caring or totally evil - but never tormented or conflicted with nothing to humanize the bad guy and the wig/glasses really made it seem all the more artificial and non-human. Last edited by Undeadcow; 09-30-18 at 11:40 PM. De Palma is clearly ripping off Hitchcock here. Seemed that way to me too, both in material and camera shots. It took me a few moments to remember/figure out the killer since I haven't seen 'Dressed to Kill' in years. Nice time capsule for New York City at the time. I've managed to stay away from this one until now. I will have to agree that Nancy Allen sure is a beautiful actress. Peter Miller was also doing the Harry Potter thing well before Radcliffe made it fashionable. All I could think is that he played Thornton Mellon's son on Back to School. There were some really fresh scenes, but I felt this one was really dated to the 80s, where it was easy to vilify transgenders and the crazies. There is even the one point where Caine is talking to the cop and he reinforces stereotypes about 'crazies', before attempting to correct the detective. Dennis Franz sure looks the same in a strange kind of way. This was a year before Hill Street and I'm sure by the early 80s, when they needed a NY cop who could really play the part, Franz was your man. In a day of twist ending for virtually every movie, I've really tired of them. My wife was saying 'The doctor did it' very early on, and it felt like it was going in this direction. I thought the movie had wrapped up after the killer had been caught, but then he escaped in size 10 nursing shoes, and we got the real ending. angie dickinson, a big star at the time gets killed off early ala Janet Leigh. was shock. It still holds up an is an excellent film with great acting. This was my first time viewing but friends who kept recommending it had essentially spoiled all of the twists for me, but I still enjoyed it a lot. De Palma films from this era have such a hazy, dream-like quality in the cinematography, it's like there's a fog over the lens. Michael Caine was great, it was interesting to see him play a more menacing character, and even though I knew he was wearing the wig and glasses, I couldn't recognize him. Does anyone know if there was a body double? Or was that actually Michael Caine in the trench coat slashing people up? The transsexual killer is harder to get away with today, but that doesn't bother me. It's interesting to see movies play out as products of their time. The technology in Blow Out is dated, but it's still a suspenseful film. 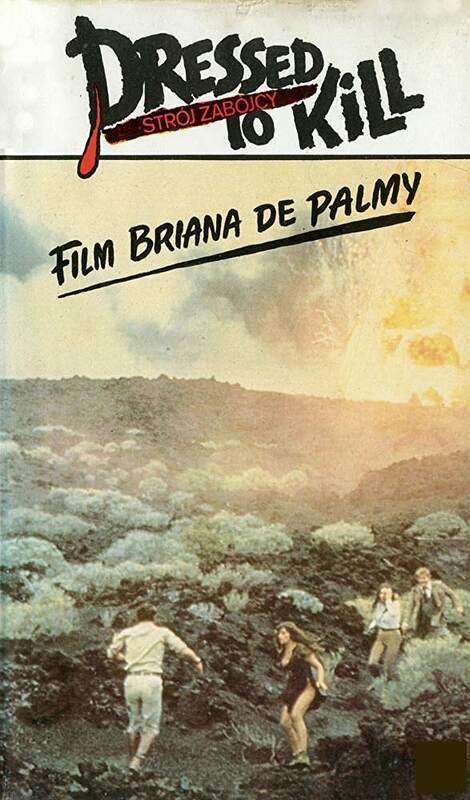 I'm going to have to track down more De Palma movies from this era. Cool! Thanks for that head's up. I watched the Criterion blu ray and and I was thinking "wow, this is WAY more explicit than the version I saw years ago". Didn't realize it was rated X though. Marked it on my checklist. Agreed. I was loving that scene at first. It felt very Hitchcockian (I know, intentionally). But after a while it was like "Okay, this is dragging on now. You lost me." Yeah. The old "it's the psychotic transsexual!" trope is a bit cringe-worthy. I gave this a 5/5 stars. I really enjoyed the style and pacing, the cinematography and acting. I saw it years ago, so I knew who the killer was, and that dampened it a bit. But on the other hand, I've been watching giallos so I picked up more on the giallo homage feel which I had no clue about back then. The bit where Angie Dickinson is dreamily smiling about her afternoon delight and writing the note, then discovers the VD cerficiate in the drawer had me laughing outloud. I just found that hilarious. In general, I liked the sexuality theme in this film, though I'm not sure exactly was DePalma is trying to say. Sexuality is dangerous? Another big thumbs up for Nancy Allen. Like I mention above, this Criterion version was so much more explicit than the one I remember seeing. It fit the film and made it feel more grown up and realistic to me. I liked that aspect of it. Was actually surprised with the fact that the taxi ride wasn't a bit more explicit since they really beefed up other scenes like the shower. Last edited by jholmes; 10-02-18 at 06:48 AM. When this movie first came out it had a very strong effect on me. For this viewing, I was very excited to watch it again and particularly excited to see that Michael Caine and Nancy Allen starred as I enjoy both of them very much. It did not disappoint as it really made me think of an Alfred Hitchcock movie. I prefer to see new views for this challenge but I felt this was a very strong choice. Just watched this for the first time in a few years, and I think it's an entertaining watch though not a great film. I'm always amused when Nancy Allen identifies the person in the elevator as a woman when to us it's obviously not, but I suppose she was in shock and just got a quick glance at the reflection. I thought it was a woman half the film. Do we know if that was actually Caine in that get-up? Michael Caine was great, it was interesting to see him play a more menacing character, and even though I knew he was wearing the wig and glasses, I couldn't recognize him. Does anyone know if there was a body double? Or was that actually Michael Caine in the trench coat slashing people up? I watched the MGM DVD from 2001 or so, and there was a making-of that interviewed most of the actors involved and De Palma. In it, De Palma notes that the only time that Caine was actually in the murderer's clothing was for the reveal in his office. The rest of the time, De Palma used the actress who played the female detective who was tailing Nancy Allen's character as the killer. They had to give her a fake nose to match Michael Caine's nose. I saw this in the theater when it first came out, and it really was quite suspenseful and had the audience guessing. I guess nearly forty years of copycat films have taken their toll, because it just doesn't seem fresh anymore. Still, De Palma's style is something to behold.